We’re both huge lovers of the humble burger, whether it’s played down with delicious but simple ingredients or dressed to the nines and fully loaded with everything in the kitchen, but let’s be honest, they’re not the lightest meal and can sometimes leave you feeling super sluggish. 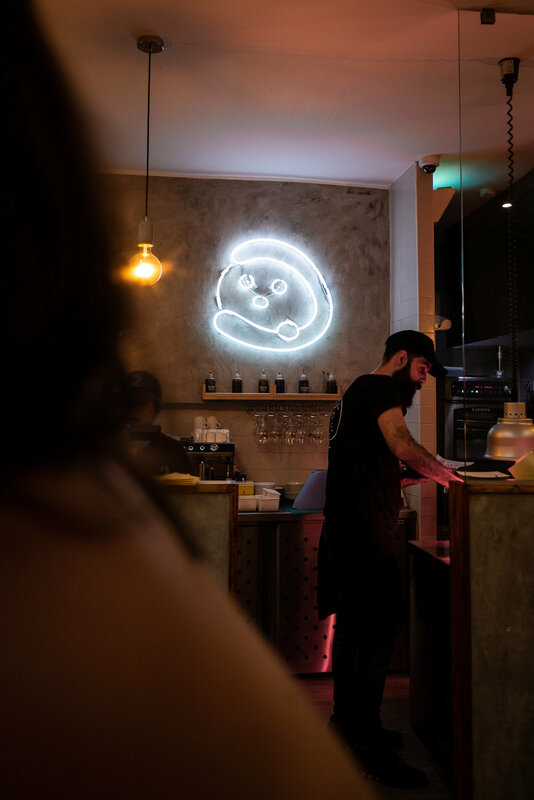 Whenever we’re on a city break (or even visiting new places at home) we’re constantly on the lookout for somewhere that serves a good bao. For us they’re all the goodness of a great burger but with that light fluffy bun and a bit easier to tackle in size. 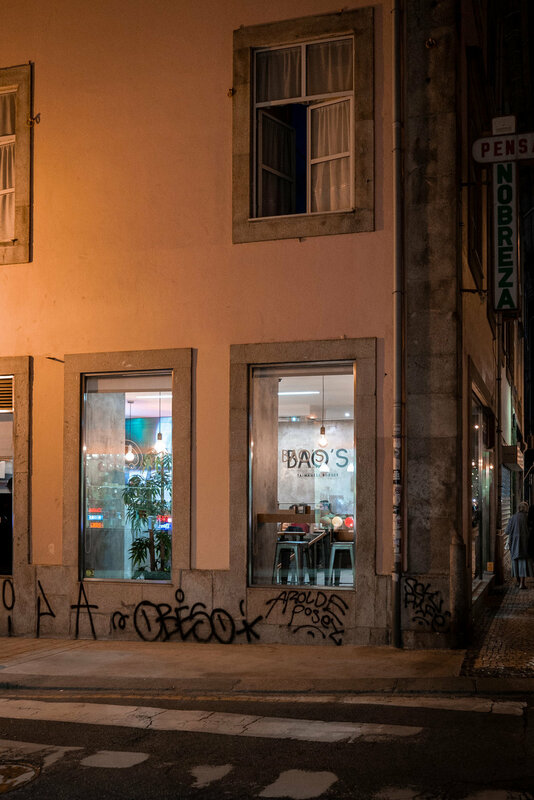 Bao's Taiwanese Burgers serves up that in great doses from Porto’s quirky hipster area. Like usual we spied this place out before flying because we’re always on the hunt for the best of the best and that means lots of planning! Luckily it was only around the corner from our apartment too and there was a handy little craft beer place halfway there (it’d be rude if we didn’t drop in right?). The place itself takes up a pretty sizeable corner plot with seating on the ground floor next to the open kitchen and then additional seating downstairs for all the hungry bao fanatics. There’s a super cute neon sign, plenty of punny posters and good music too (they played Bowie all evening when we were there which may of encouraged lots of bad singing from the two of us). The chicken bao is an easy winner - fried crispy chicken, lettuce, coriander and peanut sugar - if you try just one make it this one! That said, if you're a tofu lover try the veggie option - crispy tofu, pink pepper, mango chutney, daikon and shallots - tasty enough to convert the most carnivorous of eaters. Even the fries are delicious, we'd recommend the Fries 101 which are smothered in cheese sauce, caramelised onions and 101 sauce. Ps. 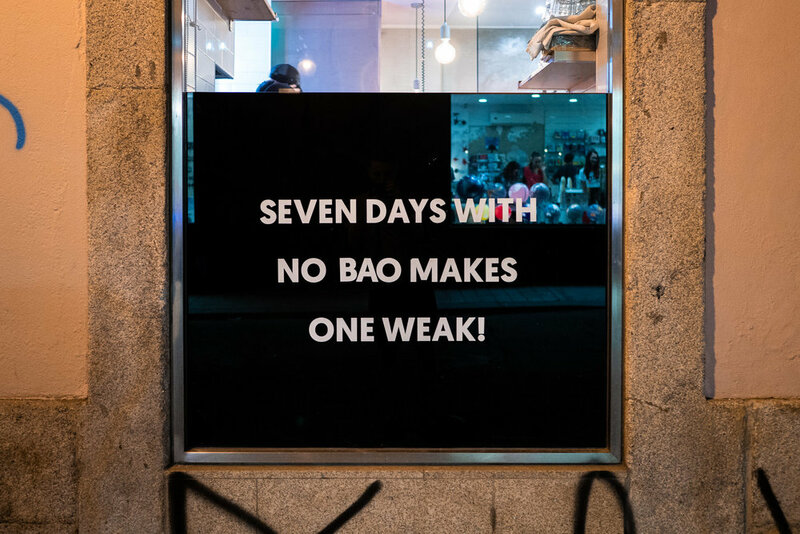 On the subject of baos, if you’re ever heading to Madrid you NEED to seek out Bao Bar, a teeny tiny restaurant serving the freshest baos and craft beers from its open kitchen at the back. We’d guess there’s around 20 covers that sweep their way around the restaurant and then about 10 baos on the menu, all of which are ridiculously tasty! Our full review of Bao Bar is here.